Three Friends and a Fork recently received an irresistible invitation and a challenge from the bloggers of Marie, Let's Eat and the Association of Food Bloggers. The invitation was to participate in blog hop called, Food from Fiction, and the challenge was to read a book, cook something to go along with the book and blog about the book and recipe. Unfortunately, while butterscotch bars sounded delicious, I am not a big Lane cake fan (with or without shinny) and I was really wanting to read something by a new (to me) author. 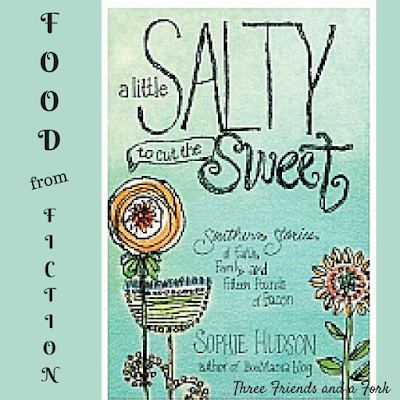 After canvassing my friends, I settled on the book A Little Salty to Cut the Sweet, by Sophie Hudson. My friend, Kim, highly recommended this book and she was a little aghast that it had not already crossed my reading radar. Shame is a big motivator for me, apparently, because A Little Salty to Cut the Sweet was the book I chose. 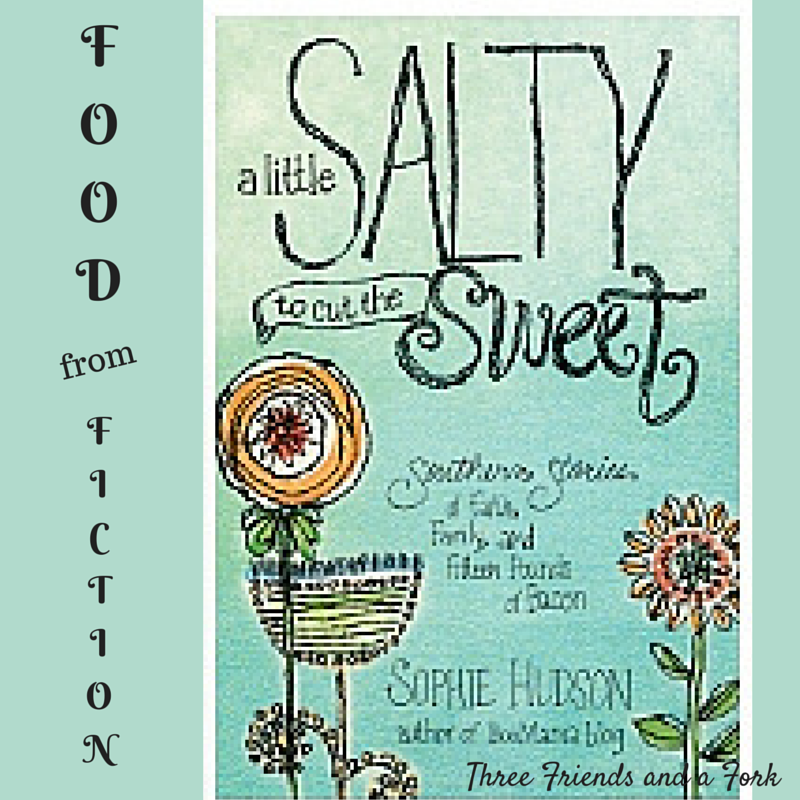 The author, Sophie Hudson, is a fellow southerner, raised in Mississippi and currently living in Alabama. Her book is a series of stories any southerner would find familiar. She talks about growing up around the dinner table, listening to the adults in her family talk. The stories they told are the stories that found their way into A Little Salty to Cut the Sweet. The tales are, funny, sweet, full of faith and quirky, in the way all southern families are quirky. Seriously, if we were able to take out the names of Sophie's family members and replace them with the names of our own family members, we could comfortably pull up a chair to Sophie's family table and feel right at home. Sophie's Aunt Choxie and Uncle Joe could easily become our own Aunt Minnies and Uncle Hermans, because we would be listening to tales eerily similar to the stories we grew up with. For instance, at one point, Sophie utters something so ridiculous and offending that her mother and aunt look at her as if she "had horns covered in white satin and seed pearls growing out of my head". What southern daughter has not received that look from her mother at some point? And the food? Every dish placed on the table in this book is a dish we have found on our own southern groaning boards. Fried chicken, black-eyed peas, deviled eggs, homemade rolls, pound cake, Italian cream cake, boiled shrimp, and mashed potatoes are all foods we understand just as well as we understand the terms, "Hey, y'all!" and "Bless her heart!" No tandoori or falafel here! These recipes, just like the tone of the book, are straight up southern classics. One of the recipes in the book is called, Green Beans Y'all Won't Believe. Uh, yes, Sophie, I would believe, because my family has a recipe that is very similar. I could not resist making both so that I could compare the two. Ok, I could not resist making sure that my beans were better than Sophie's, but I do not want to imply that I am competitive at all. Well, maybe just a tad. While both recipes are delicious and nearly the same, I think my family's bean recipe is the best. Of course, that is just the way we are in the South. Our mama's recipes are always the best. Truthfully, I just happen to like onions in my beans rather than almonds, but I will let you all be the judge. Here are both recipes, Sophie's Green Beans Y'all Won't Believe and My Family's Sweet and Sour Green Beans. What are you waiting for? Get busy and let me know what YOU think! For either recipe, start by preparing the bacon. Bacon is a big contributor to the flavor in both recipes and a big reason Sophie calls her recipe, Green Beans Y'all Won't Believe. Take it from me and make the cooking of the bacon easy by baking it in the oven. Just line a large baking sheet with heavy duty foil, place a rack in the pan and lay the bacon out flat on top of the rack. Bake at 400 degrees for 15-18 minutes until bacon is crispy. Now you are ready to gather the other ingredients. Both recipes call for canned whole green beans, white vinegar, sugar and bacon grease. The main difference in the two recipes is that Sophie's beans call for sliced or slivered almonds and 6 cans of beans and my family's version calls for chopped onion and 3 cans of green beans. Both recipes start with canned whole green beans, bacon, sugar, vinegar and bacon grease. Sophie's recipe has almonds and calls for 6 cans of beans. Place beans in casserole dish. Mix bacon grease, sugar and vinegar over medium heat until sugar dissolves. Sprinkle bacon on top of beans and pour liquid mixture over all. Garnish with slivered almonds. Bake at 325 degrees for 25-30 minutes. My recipe calls for 3 cans of green beans and 1 chopped onion. Place a layer of beans in a flat casserole dish, then a layer of onion and a layer of bacon. Repeat layers. Combine vinegar, sugar and bacon grease (or olive oil) and pour mixture over beans and bake, uncovered, at 350 degrees for 30 minutes. Then cover with foil and cook an additional 30 minutes. Yields 8 servings. You really cannot go wrong with either one of these indulgent recipes. While I would not encourage you to make either recipe on a daily or weekly basis, they are delicious for special family get togethers. And for more book inspired recipes, be sure to check out the other Food From Fiction choices in this blog hop. Thanks for stopping by! You can get a PRINTABLE copy of both recipes HERE. This post is one in a series of FOOD FROM FICTION recipes organized by the Association of Food Bloggers. If you enjoyed this recipe, please hop to the next in the series! Green Beans never looked so good!